Week two of the playoffs have arrived and this is where the fun happens. We bid adieu to some worthy teams last week like Butler, Lafayette and Samford… haha, okay kidding. Who saw South Dakota State trampling Northern Arizona like they did? Wow, that was a beating. I did not anticipate Sam Houston State beating Southern Utah as bad as they did, nor did I see Fordham and Sacred Heart being so close. The Pioneer League representative getting beat down by the second place OVC team wasn’t surprising and a shame that the PL ate up a playoff spot over another MVC team. Let’s get to this week’s games.. The Furman Paladins gave a third quarter beatdown to South Carolina State last week and ran away with a 30-20 win over the Bulldogs. Their reward for winning their road playoff game? Another road playoff game in Fargo. That’s actually a really crappy reward for winning. They will head North to take on the North Dakota State Bison from the NFC East. The Bison are led by quarterback Brock Jensen who shocked the world in week one of the season by leading the Bison (or is it Bizon?) over Kansas State. Jensen had 26 touchdowns on the season versus six interceptions. The Bison rank second in total defense. I believe that spells trouble for Furman.. well, that and having to go to Fargo. My prediction for this game? Bison in a blowout. The winner of this game will play the winner of Montana and Coastal Carolina. Coastal Carolina is going to get to experience what “loud and cold” is all about this weekend has they leave their balmy practice fields of Myrtle Beach and head north to Missoula where the kickoff temperatures are looking like six degrees. I hope they bring some gloves. The Chanticleers defeated Bethune Cookman last week 48-24 behind a solid performance from quarterback Alex Ross who threw for 256 yards and four touchdowns. The Grizzlies are led by quarterback Jordan Johnson who threw for 2999 yards and 28 touchdowns vs four interceptions. His favorite receiver, Ellis Henderson caught 889 yards and 14 touchdowns. The Griz have the 54th ranked defense and the 21st ranked offense. My prediction for this game is a bunch of frozen Carolinians go home really cold and with a loss. The winner will play the winner of North Dakota State and Furman. The New Hampshire Wildcats eeked out a win over Lafayette last week 45-7. Who’d have thought having a 5-7 Patriot League team in the playoffs would have ended this way? The Wildcats ran out to a 21-0 lead in the first quarter and never looked back. New Hampshire played it pretty evenly throughout the game with 268 yards passing and 283 yards rushing. The Wildcats also sacked Lafayette QB Drew Reed a whole bunch of times. This week the Wildcats get a rematch with an opponent they faced off with just two weeks ago, Maine. The Wildcats won the last meeting 24-3 in Durham. The Black Bears are led by quarterback Marcus Wasilewski who threw for 3009 yards and 23 touchdowns. Maine ranks 31st in total offense and 18th in total defense. They are also the Colonial Athletic Association champions. If I had a guess I’d say their odds are pretty good in this rematch. I think Maine wins, but this one will be closer than the 24-3 contest we saw out of them last time. The winner of this will play the winner of Southeastern Louisiana and Sam Houston State. Sam Houston will get a much bigger test this weekend when they face off with Southland Conference champion Southeastern Louisiana. The Lions came out of mostly nowhere this year to win the Southland over two time defending champion Sam Houston State. The Lions are lead by quarterback Bryan Bennett who threw for 2610 yards and 18 touchdowns. The Bearkats defeated Southern Utah last week 51-20 in Huntsville. The Thunderbirds had one of the better defenses in FCS but the Bearkats piled up 355 yards rushing and dominated the Big Sky team. Southeastern Louisiana won the first matchup between these two 34-21. Will this matchup be any different? Highly unlikely, though, I get a feeling that Sam Houston is getting their swagger back. I wouldn’t be surprised to see an upset here, but I’ll go with SELA by a touchdown. South Dakota State pulled the biggest upset last weekend by defeating Northern Arizona in Flagstaff by a hefty margin, 26-7. The Jackrabbits are a pretty tough team, despite their record. They’re the kind of team you do not want to face in the playoffs, especially with a back as talented as Zach Zenner. They matchup with the Eastern Washington Eagles this week and their talented offense led by Vernon Adams. Adams was third in FCS in passing yards coming in at 4059 and 46 touchdowns. The Eagles also defeated FBS Oregon State in the first game of the season. South Dakota State has the type of offense you don’t want to see in the post season. They can control the ball, control the lock, and punch you in the mouth all day long. Montana had a scare with them in 2009, NAU got beaten down by them in 2013.. is Eastern Washington next? If there was going to be an upset this weekend I’d say it happens right here. SDSU is a punch you in the mouth team, the type of team Eastern Washington does not want to play. I’m calling an upset here (flame away, Eagle fans, I know you will), but it’ll be slim.. say, a last minute field goal type of win. The Gamecocks of the non-Spurrier variety trampled poor Samford last weekend 55-14. I’m not sure if Samford is that bad (they are), or Jacksonsville State is that good (they aren’t). Regardless, the Gamecocks are on their way to Lake Charles to take on the Cowboys of McNeese State. McNeese is led by quarterback Cody Stroud who threw for 2680 yards and 27 touchdowns. The Cowboys own a FBS win this season over South Florida, and by a hefty margin over South Florida to open the season. They had a pretty WTF loss to Northern Iowa and a huge loss to Southeastern Louisiana. I have no idea what this team is capable of, but I’m pretty sure I expect a track meet between these two teams. Track meets are hard to predict but I’m going to take McNeese in this one, because they’re at home.. that’s pretty much the only reason here. Roll pokes. The Fordham Rams got into the playoffs as an at-large because they started funding football a tad bit earlier than their Patriot League friends.. their first playoff game this year resulted in a 37-27 victory over NEC champion Sacred Heart. The Rams had complete control of this game from start to finish, led by quarterback Michael Nebrich who threw for 413 yards and three touchdowns. Will he be able to accomplish the same against a stout Towson defense? Towson ranks 20th in total defense, while Fordham ranks 6th in total offense. Who’s going to give here? I’m giving the edge to Towson. The Tigers are led by quarterback Peter Athens who threw for 2634 yards and 14 touchdowns. He also turned the ball over 12 times. Running back Terrance West rushed the ball for 1875 yards and 30 touchdowns, best for 2nd in FCS behind Zach Zenner. The Tigers win this game going away, probably by a couple of scores. Tennessee State took care of a pretty awful Butler team 31-0 in the first round. Why Butler was in the playoffs is a mystery to me, but I’m pretty sure San Diego would have been owned just as bad. Seriously, Pioneer League, this is what you contribute?? Tennessee State dominated from start to finish, and were helped by three Butler turnovers from quarterback Matt Lancaster. This week will be a much tougher test for the Tigers as they take on conference foe Eastern Illinois. The Panthers are led by quarterback Jimmy Garoppolo who threw for an eye popping 4489 yards and 48 touchdowns. That’s outstanding and he’s being rated as one of the better quarterbacks to go in the 2014 NFL draft. 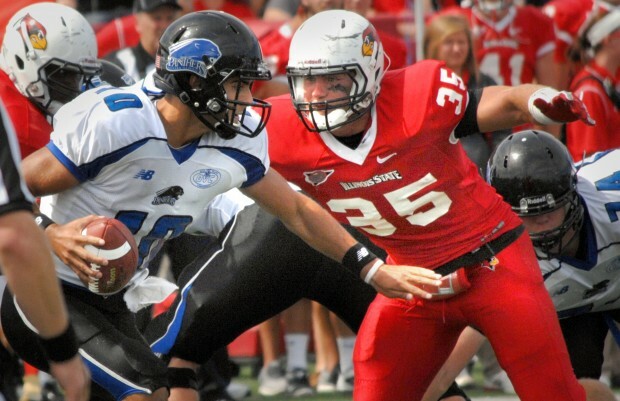 Eastern Illinois won the previous match-up between these two 34-16. I can’t imagine the score of this game being much different, in fact, it could be more. The Panthers roll big in this one. This is the real playoffs here, boys. Last week weeded out the weak who probably didn’t deserve a spot in the playoffs (sorry, Northern Arizona, flame away). This week is when the action really starts and there are some great matchups that should provide plenty of entertainment. I anticipate plenty of blowouts this week, Montana and Coastal Carolina, NDSU and Furman, Eastern Illinois and Tennessee State, and probably Towson and Fordham. The best matchups this week are probably in Cheney and Hammond. Both games could possibly turn into track meets. A track meet doesn’t favor SDSU, but SELA and SHSU could be VERY entertaining. This is great football people; I hope we have terrific games this weekend. If you’re in Missoula, like I will be, dress warm and drink plenty of Fireball because it’s gonna be a chilly SOB out there. If you’re in Fargo, this is standard operating procedure for you crazy people. If you’re Coastal Carolina, please keep your players fathers off of Facebook and wear a jacket.